G17 star database installer (at link) for the internal astrometric solver. Contains 105 million stars up to magnitude 17. A 500 MB file. Alternatively you could install the G16 star database. Contains 60 million stars up to Johnson-V magnitude 16. A 320 MB file. The G16 contains both the calculated Johnson-V magnitude and colour information (GBp-GRp) for star annotations. If you need a Linux 32 bit version, send me a request. ASTAP debian package (at link) version 0.9.202 dated 2019-4-17 This version can be used as an astrometric solver. E.g. for CCDCIEL. 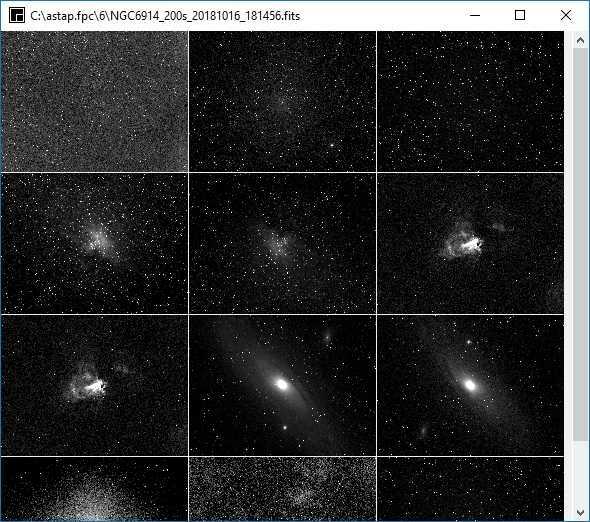 ASTAP is a free stacking and astrometric solver (plate solver) program for deep sky images. 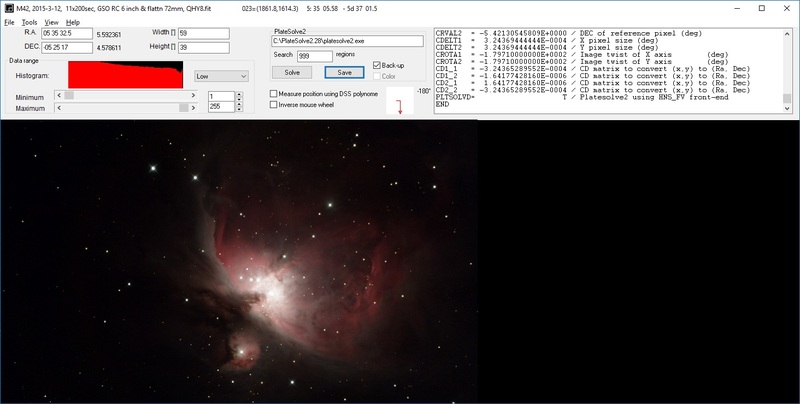 In works with astronomical images in the FITS format, but can import RAW DSLR images or XISF, PGM, PPM, TIF, PNG and JPG images. 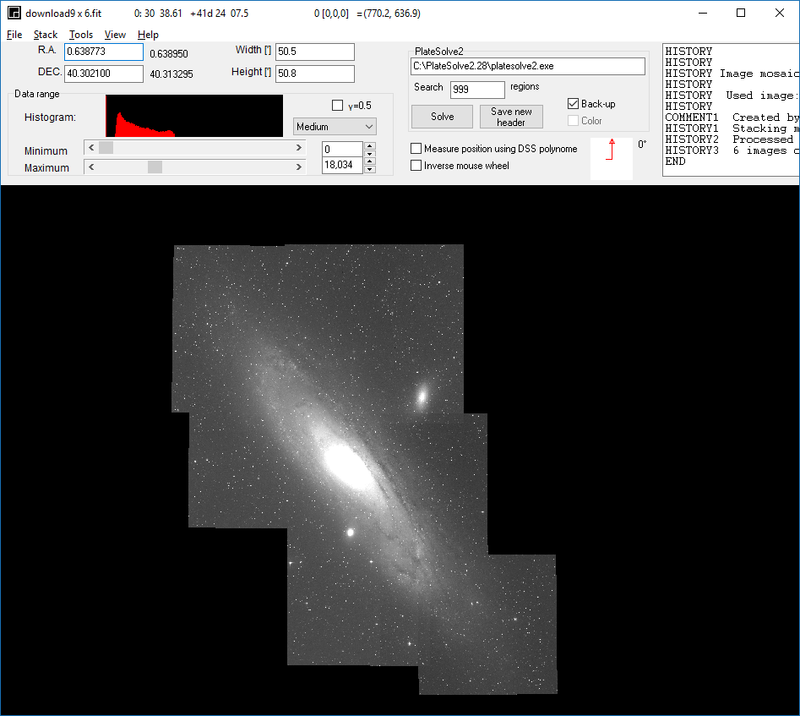 It has a powerful FITS viewer and the native astrometric solver can be used by CCDCiel, APT or SGP imaging programs to synchronise the mount based on an image taken. Native astrometric solver, command line compatible with PlateSolve2. Alignment using an internal star match routine, internal astrometric solver or a call to a local version of Astrometry.net. 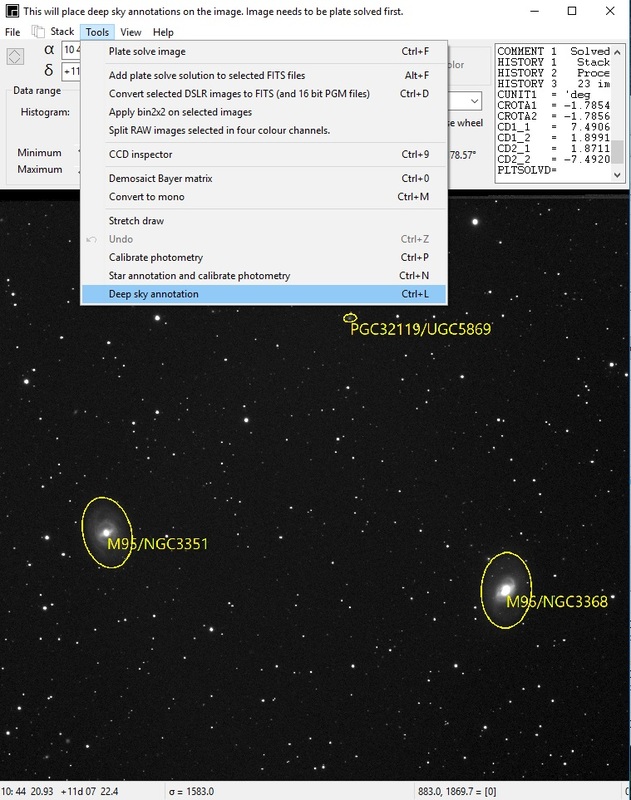 FITS viewer with swipe functionality, deep sky and star annotation, photometry and CCD inspector. Results can be saved to 16 bit or float (-32) FITS file. Export to 16 bit PNG, 16 or 32 bit integer TIFF files, 16 bit PPM/PGM files for best preservation or simple 8 bit PNG, BMP or JPEG. Mosaic building covering large areas using the astrometric linear solution WCS or WCS+SIP polynomial. Stacking of astronomical images is done to achieve a greater signal to noise ratio, prevent sensor saturation and correct the images for dark current and flat field. Additional imperfect images due to guiding, focus problems or clouds can be removed. This is a screen short of the stack menu. It contains several tabs for the file list and settings. File can be sorted on quality and values.The image can be visually inspected in the viewer by a double click on the file or using the pop-up menu. Program requires FITS images or RAW files as input for stacking, but it can also view 16 bit PGM /PPM files, XISF files or in 8 bit PNG, TIFF or BMP files. For importing DSLR raw images the program DCRAW from David Coffin is used. For stacking the internal routine compares the image star positions to align. To uncheck/untick poor images there is an option to do that automatically. First check mark the option "After analyse untick worst images". Then press button "analyse images". The images will be analysed and the images with abnormal (outliers) HFD values or "Number of star detected" will be unchecked. The adjustable factor used is the standard deviation represented by the Greek lower case sigma σ letter. To undo you have to check the images manually again, e.q. with the popup menu of the right mouse button. 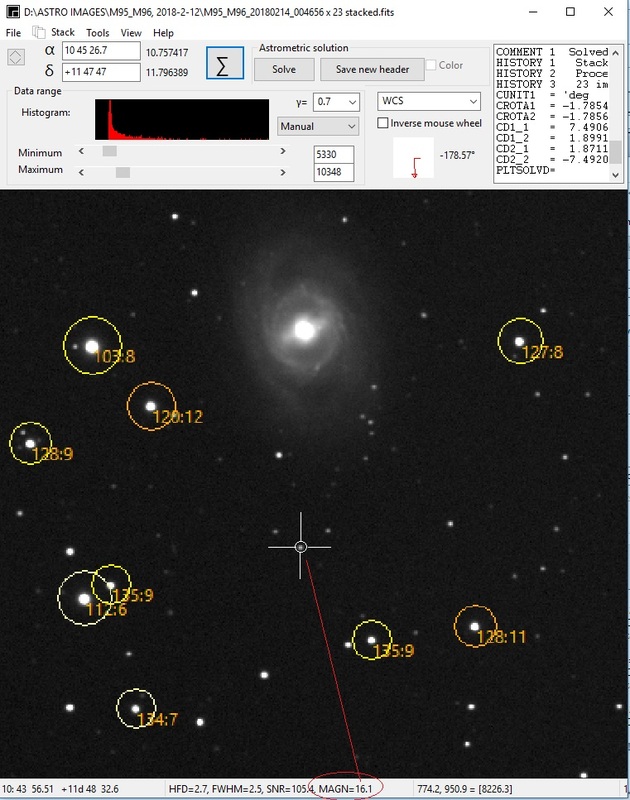 ASTAP can be used as astrometric solver to synchronise the telescope mount position with center position of an image taken with the telescope. Existing images can be solved to annotate, for photometry or the measure positions of unknown objects. The ASTAP solver aims at a robust star pattern recognition using the catalog star coordinates in Equinox J2000. The solution is not corrected for optical distortion, refraction, proper motion of stars and other minor effects all to be very minor. The process astrometric solving is often referred to as a "plate solve". That was a correct description in the past, but in modern times there are no photographic plates involved in the process. For the astrometric solution it can use either the internal solver or a local version of Astrometry.net. The installer will install it at c:\Program Files\astap . The single executable astap.exe can be used anywhere. The purpose of the stacking routine is to combine astronomical images to reduced noise and to flatten the image. 1a) Several light frames. Images of deep sky object unprocessed. 1b) Several dark frames of the same temperature and exposure as the light frames. A dark frame is a frame that represents an exposure done in total darkness. This signal includes the bias signal, but also includes any dark current charge accumulation, and thus any dark current noise that exists within the dark current signal. 2b) Flat dark frames or bias frames ideally of the same temperature and exposure duration as the flats. Since flats are taken with very short exposure times, either flat dark of bias image of almost zero seconds will do. Only light frames are essential. The flats will be combined to an average and the combined average flat-darks will be subtracted to have a near ideal presentation of the vignetting called the master flat frame. The combined dark frames called master dark will be subtract from the light frames to extract the pure deep sky signal. The combined light frames, dark compensated in 2) will be flattened by dividing it by the master-flat resulting in the final deep sky image. Prior to this a small 2x2 or 3x3 median filter is applied the master flat to reduce noise. Call up the stack window using the Σ button. In tab images, dark, flats, flat darks, select the select the images, dark, flats, flat darks (bias) frames. In most cases you could select all frames in tab images. The program will move the fames to the corresponding tab during analyse. In tab images (for the light frames), press analyse and remove manually any poor image. 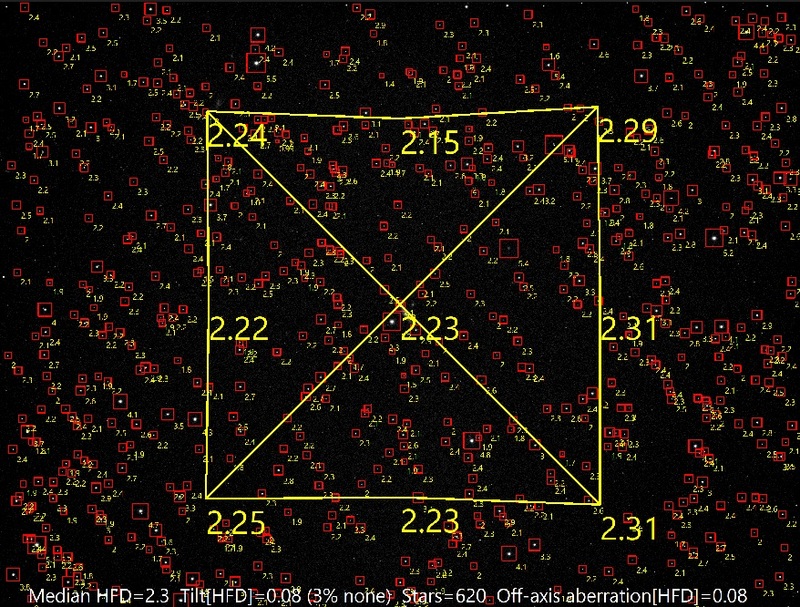 Poor images can be detected by a too high HFD (Half flux diamater stars), low number of stars or high background value( by clouds) . Loss of tracking could result in too low HFD value. If required inspect each image by double on the file name. The list can be sorted by clicking on the corresponding columns. Using the pop-up menu selected bad frames can be renamed to *.bak for deletion later. In tab stack method select the stacking method, average or sigma-clip-average. For OSC camera images select "Convert OSC images to colour". Select the correct Bayer pattern (4 options). Test the required pattern first in the viewer with a single image. 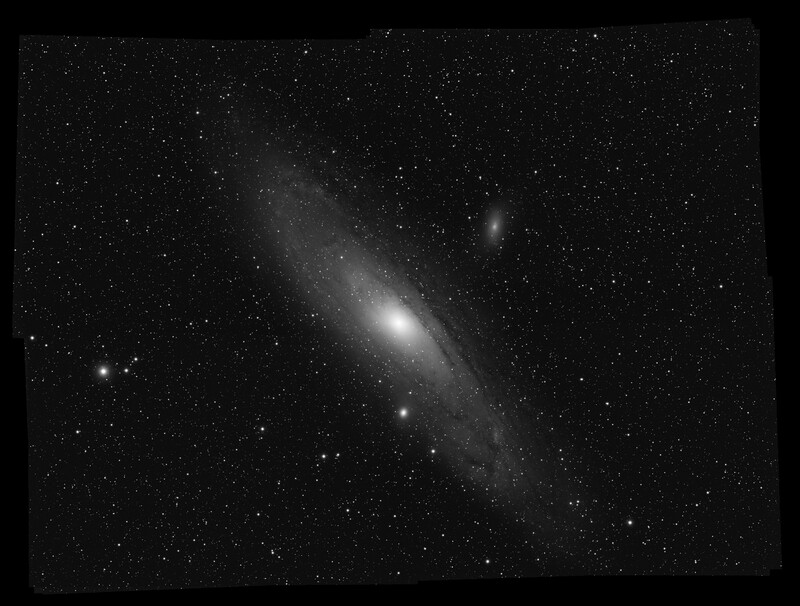 The source images should be raw (gray) without colour produced by astronomical camera's. Leave this to the default star alignment. Leave the parameters "star alignment and astrometric alignment at default values. Leave all check marks initially unchecked. These classify options can be used later to combine the correct darks and flats and to stack several image series in one operation. f) Press the stack button. The darks and flats & flat-darks will be combined in a master dark and master flat frame. Then the program will combine the light frames to the final image and save it automatically. This will take some time. Use the resulting FITS file. Crop the sides if required using the pop-up menu. Equalise the back ground if required using the tool in tab pixel math. Export as stretched JPG or 16 bit bit stretched TIFF. The stretched export follows the gamma and stretch setting of the display. All the program settings and file selections will be save by leaving the program or click on the stack button. This is possible with the internal astrometric solver or local version of Astrometry.net. The reference of each pixel is the astronomical position. So stacking is not done against a reference image but against an position array set by the first image. If the oversize is set from the default 100 pixels to a large value lets say 2000 pixels, the array is on all sides 2000 pixels larger then the first image. If the first image is 2000x1500 pixels, the stacking array will be 6000 x 5500 pixels large. So any following image will be placed in this 6000x5500 pixel array. If the images are taken from different areas of the sky, the stacking will result in a mosaic as long the proceeding images are within this 6000x5500 pixels. Stack the tiles separately using method SIGMA-CLIP-average and use for the alignment the internal STAR alignment method. Inspect the resulting tiles and crop them if required. You can also crop them later automatically with "Mosaic skip outside pixels" Do this for each color separately if you have separate files. Crop the stacked result to about 5000x5000 pixels. If required, apply the median-equalising filter under tab Pixel Math to equalise darker areas. If you have seperate colours, check-mark the option classify by filter and stack the 3 seperate mosaics to colour. Adjusted the stretch range and save as JPEG, 90% quality. Stack multiple objects: Several objects can be stacked in one run. If the classify-by-object is check-marked, the program will stack all objects and save the results using the available darks and flats. Analysing and removing of the bad ones: Before stacking the images can be analysed with the analyse button. Images with a high HFD value are most likely unsharp and can be inspected in the viewer by double click on the filename. The file can be renamed to *.bak by the pop-up menu to be removed later. Images with a high background indicating clouds or twilight should be removed/renamed to *.bak. Sorting: Images can be sorted on any of the columns. For example if you click on HFD, the images will be sorted on HDF. You could then remove the images with the highest value or inspect them by double click on the file name. Dark classification: If classify by exposure time and/or exposure time is check-marked the program will automatically select the correct darks or master dark. So it is possible to keep several dark files check-marked in the darks tab and the correct master dark will be selected automatically. Colour stack and Colour filter classification: If the classify-by-filter is check-marked, the stack routine will combine the available filters to a RGB image. If only Red + Green +Blue image are available they will be combined in a RGB image. If Luminance images are available it will first stack the RGB colors and then apply a most-common-filter and Gaussian blur on the RGB result. Finally the luminance image is coloured with the RGB result. The filter factor should be set typically near 20. To record star colours use RGB only. It could be better to stack in two steps. First prepare the Red, Green, Blue and Luminance stacks. Then run a stack again with the Red, Green, Blue and optional Luminance. Or if you could revisit the produced interim results in the RESULTS tab en copy them to the IMAGES tab using the pop-up menu. You could try different colout factors. Image file names containing "_stacked" will be un-checked by default to prevent stacks by accident are re-used. If required, just select the file and check-makr it again. Organising images, darks, flats and flat-darks: Images placed in the first tab will be organised based on the FITS header keyword IMAGETYP. So as soon you click on the image analyse button, dark and flats and flat darks/bias images will be move to the corresponding tab. Keyword modification: The pop-up menu has option to update a keyword of multiple files if required. The stacking of OSC images works best if you start with raw image before it is converted to colour. The raw colour images look mono, but the program will convert them later in the stacking process. There are 4 different Bayer pattern. They are identified as 00, 1,0, 0,1, 11 and can be set in the stack tab "stack method". Try emperish which will result in the correct colours. Load a raw image in the viewer and convert it using tools menu option "convert bayer matrix"(CTRL+0). If the colours are not correct, just hit CTRL-Z to recover and try an other bayer pattern setting in stack tab "stack method"
Select for OSC image 2x2 mean for flats, see tab stack method. This will prevent any interfering patterns due to the 2x2 Bayer matrix. Power down option after completion: If stacking takes a long time you could activate this option and the program will be power-down the computer after completion. The stack results are reported in the results tab. By a double click they can be viewed the viewer. The number of files and exposure times are given. With the pop-up menu it is possible to copy the image file path to the clipboard for use in a file explorer. Darks filter: Typical setting, apply Gaussian blur of 3.0 below the noise standard deviation σ =2.5. 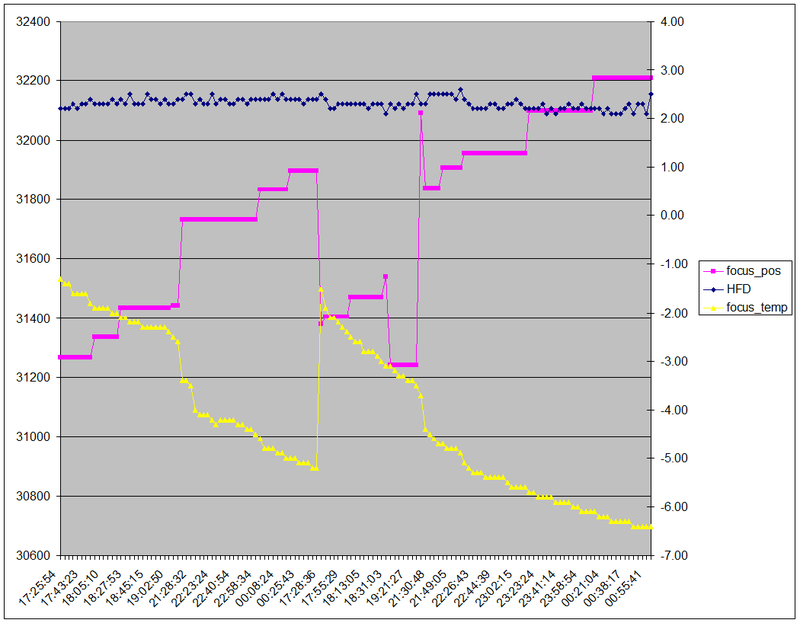 For noise CMOS sensor you could select restore hot pixel above σ.
Stacked image: Best option is "Sigma clip average". For only 2 or 3 images or when you are in a hurry "average"will do. Raw one shot colour images (OSC): RAW images of DSLR cameras /One shot color cameras are monochrome and have to be converted into colour images (after applying darks and flats). This converson is called demosaic or debayer. First set Bayer pattern correctly by loading a raw image (grayscale) in the viewer and try one of the bayer patterns till the image colours match in viewer. If not hit CNTRL-Z to undo and try a different Bayer pattern. AstroC, colour for saturated star, as bilinear method but for saturated stars the program tries reconstruct the star colour. AstroM, white stars, as bilinear method but if there is an unbalance between the 4 red, 4 blue or 2 green pixels it uses luminance only. Effective for unsampled images and stacks of a few images only. Star colour is lossed if undersampled but star will become white. Bayer drizzle, no interpolation but large amount of images are required. The raw image is coloured depending on the Bayer pattern and used in stacking. When sufficient images are stacked and there is some natural drift each position will get red, green or blues values averaged. The sky background and transparancy should be stable while imaging to achieve a good stacking result. Malvar-He-Cutler 1), advanced method for interpolation but less effective for undersampled OSC images. Background noise is lower. Super-pixel, This simple and method reduces the image size to half. Super-pixel could be used if the images are near or over-sampled. If your using a H-alpha filter in front of an OSC camera, by using the super-pixel de-mosaic method, you could just remove the green and blue signal to create a noise free red image and then convert it to mono. This makes processing simpler. There is no interpolation between the R,G,G and B pixels, so any noise from G an B pixels can be separated from the red. If the image are under-sampled and the star colour is random after stacking, use AstroM, white stars. Stars will be whiter. Star colour will be lost. If your using a monochrome filter like H-alpha, use superpixel method and split the images in R, G, G, B before stacking and use the red image for future processing. The background colour noise can be removed with option "Background colour removal" in the pixel math tab of the stacking menu. The DSLR OSC images will be automatic converted to FITS files by the DRAW program included. Oversize: This could be 0, 100 or larger. This overlap was introduced to show overlapping images. If you don't want a black Set this a zero if If you have accurate mount you could se for mosaic's If you want to make a 2x2 mosaic, the overlap should at least the width of the images. The settings will be saved automatically if your either exit the program or start a stack. There are test buttons for the dark and mean filter. They will be applied on the image in the viewer. For CMOS darks it is recommend to select restore hot pixel above σ is 3 or 2.5. For alignment there are three options, internal star alignment, native astrometric solver or a local version of Astrometry.net. For mosaic building you have to use the internal astrometric solver or Astrometry.net. This internal star matching alignment is the best and fastest option to stack images. It is not suitable for mosaics. No settings, fully automatics alignment for shift in x, y, flipped or any rotation using the stars in the image. It will work for images of different size/camera's with some limitations. The program combines four close stars into an irregular 2D tetrahedron or kite like figure (and compares the six irregular tetrahedron dimensions with irregular tetrahedrons of the first/reference image. It selects at least the six best matches and uses the centre position of the irregular tetrahedrons in a least square fitting routine for alignment. There is only two settings relevant but normally you don't have to change them. Tetrahedron tolerance No need to change it. Leave this at 0.005 unless you have severe optical distortion. If you have false detections, set this lower at 0.003. Maximum number of stars. Typically set at 500. Background info: A irregular tetrahedron (or triangular pyramid) drawn from 4 star positions has six edges. The five shortest edges are divided by the longest side to scale them independent of the image scale. The final irregular tetrahedron definition is then the scaled length of the five edges, the centre mean position and the pixel length of the longest edge. For tetrahedron matching the scaled five edges are used. There scaled lengths will be independent on the image scaling. This will give a number of tetrahedron matches. From the matching tetrahedrons list, the not scaled sixth edge is used to calculate the mean and standard deviation and outliers of more then 3 * σ are removed. (three times the standard deviation). From the remaining list of tetrahedrons, the central mean positions are used for LSQ fitting in two dimensions. For each star, the tetrahedron is constructed from the nearest stars. Some edges could overlap. Duplicates are removed. Duplicates could occur from four close but lonely stars. The tetrahedron selection can be demonstrated by the "draw tetrahedrons"button in the alignment tab. You could reduce the number of tetrahedrons drawn by the setting"maximum number stars used". There are two option for astrometric alignment. The internal solver is quicker and adequate for most stacking. If somehow the alignment is not working it is possible to use a local version of "astrometry.net"
Diameter field: This is the square size of the star field in degrees used for detection and will be set automatically for most FITS files. It should be in range with the image diameter. Radius search: Search radius in degrees. If there is no match, the program will move the search field around in a square spiral and increasing the distance form the initial position up to the radius specified. A radius of 30 degrees could be searched in a few minutes. Maximum number of stars to use: No need to change it. This could be set between 100 and 1000. Cropping: For very large image above typical 3 degrees height the solver will only look to the center of the image. The internal plate solver works best with raw unstretched and sharp images of sufficient resolution where stars can be very faint. Exposures 5 to 300 seconds. Heavily stretched or photo shopped images are problematic. This option allows alignment of the images based on a single star, asteroid or comet. If this option is activated, the list of images in the image tab turns red. Double click on each image in the list and click on the star/comet of asteroid to be used as reference. This object is then marked with a little purple circle. The position will be auto centered. (and the X,Y position will be added to the list) A poor lock is indicated by a square. If so try again till it is a circle. If all images in the list are turned green, so contain a value, then click on the stack button. For objects which are moving in the sky, select the stack option "average" and not option "sigma clip". Several options including background equalising. The viewer has a preview function. After opening select Preview FITS files. The preview is displayed in the ASTAP viewer. The current zoom and position is maintained so you could study the corner of a series images on image quality. For JPG, PNG or RAW files it is possible to add the object position using the deepsky database. Double click on RA position in viewer and enter the object name. The position will be retrieved from the database. This position will be used for the solver. ASTAP has a FITS thumbnail viewer (ctrl-T). This could be useful to browse your FITS files. By clicking on the thumbnail it will be opened in the viewer. With a right mouse button click some options are available as changing directory, copy, move, rename or rename to *.bak. The thumbnail size is depending on the form size. Make it larger, the thumbnails will follow. Thumbnails are organized in 3*X. So the thumbnails are pretty big by purpose. The images are fully loaded in memory so it will consume some memory and time. So don't try get thumbnails of 400 images. 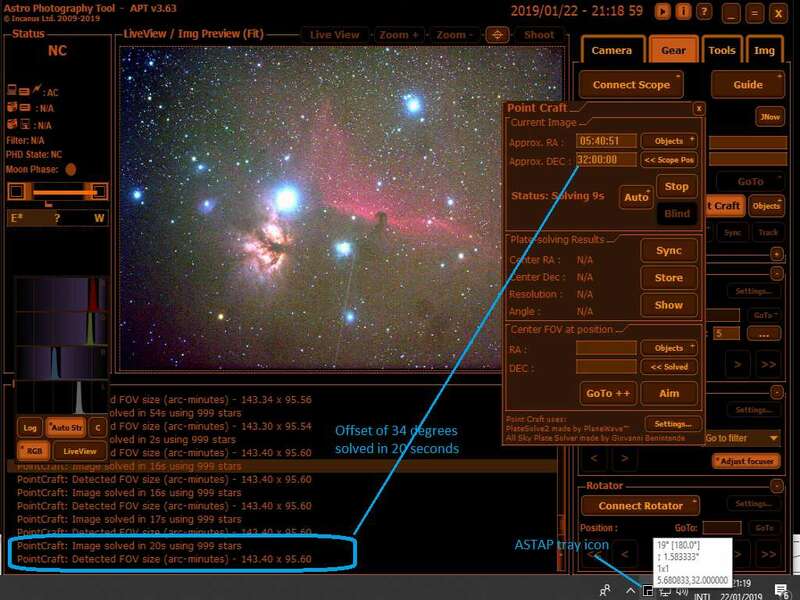 A second menu option is to annotate the stars and auto calibrate the program for photometry. This can be done either by the G17 or G18 star database (G- magnitudes) or if you replace them by the G16. This database contains the calculated Johnson-V magnitudes. ASTAP has a CCD inspector under tools for median HFD value and Tilt measurement. This will quickly show any focus problem in the corners:. The squares are 5 times the HFD value. Center lost windows Ctrl+F12 Use this if you have multiple screens and once window is out of site for some reasons. To analyse the relation between the HFD value, focuser position, temperature and altitude it is possible to copy the data from a FITS image list to the operating system clipboard. Just select a number of images, click on the analyse button. Then select all relevant files and copy the data with right mouse button. Then copy the data into a spreadsheet for analysis. With the batch routine several FITS image can be "astrometric solved". Raw images of OSC (color) sensors using a Bayer matrix can be converted to color. ASTAP can imitate PlateSolve2 and add the plate solution to the FITS header. Also PNG, JPEG, TIF, BMP files can be plate solved if an estimate of the center position is given. See Usage as astrometric solver and command line options:. There is a big variation in FITS file keywords and usage. If your FITS file is not read, please send me the file for testing. Where to find: pop-up menu of the viewer. Objective: To local improve the stacked image. Usage: Select the area while holding the right mouse button down. Select the local option. The simplest way to solve an image is just to load an image in the viewer and hit the solve button. Some settings are available in the ∑ menu under tab alignment. The solution will be added to the fits header and center of the image will be displayed in the log ∑ menu. Click on the save button to save the FITS file with the solution. With the solution, the status bar will show the astronomical position of the mouse pointer. The internal astrometric solver works best with raw unstretched and sharp images of sufficient resolution where stars can be very faint. Heavily stretched, saturated or photo shopped images are problematic. It requires minimum about 30 stars in the image to solve. Images containing of a few hundred stars stars are ideal. For star rich images, the program will reduce the detection limit to limit the number of stars. This will only work for unstretched images where brighter stars have a greater intensity then fainter stars. So ASTAP requires three star dimensions for solving. The x, y coordinates and intensity. Oval stars due to tracking errors or severe optical distortion will be ignored and solving could fail. Estimated center of image should be entered/available in the viewer α and δ input or passed by command line. For FITS this is normally automatic set. Field of view of the camera should be available. This is the height of the image in degrees. See ∑ window, tab alignment, group-box astrometric settings. For FITS images this is normally automatic calculated. Image height in pixels after subsampling should be somewhere between 1000 and 3000. If it is higher set subsample at 2 or maybe 3. Search radius should be set large enough. See ∑ window, tab alignment, group-box astrometric settings. You could set this at 30° or larger up to 180°. Stars in the image should be pretty round. 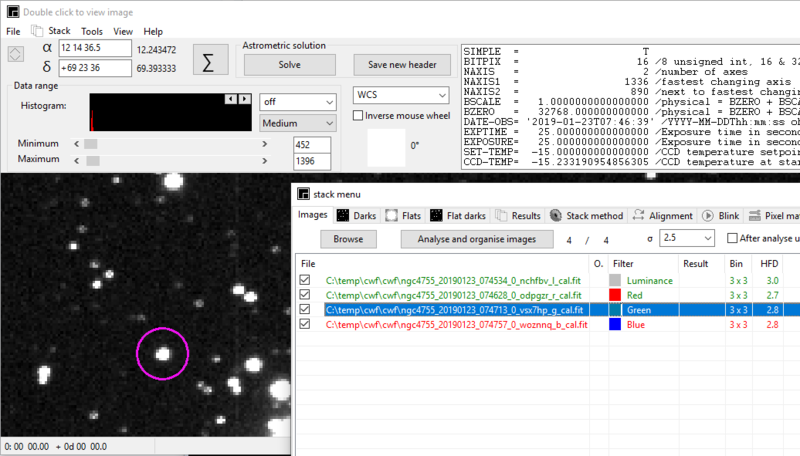 You could verify the star detection by the CCD inspector or by the "test button to show tetrahedrons" in the ∑ window, tab alignment). All bright stars should be detected. About 30 stars or more should be visible in the image. They can be very faint, barely visible in the noise. For images filled with stars, only a few stars should be saturated. The total exposure time could be hours as long it is possible to separate the brightest stars from the faint by intensity. For bayered images (OSC cameras) or large images use the x2 downsample option. See ∑ window, tab alignment, group-box astrometric settings. The maximum number of stars to use should be defined. Typical set at 500. See ∑ window, tab alignment. Tetrahedron tolerance should be defined. Typical set at 0.005. If you expect optical distortion set it higher. See solver window, tab alignment. Solving of wide field images covering a field of 10 degrees or more will most likely fail. For some failures you could force in ASTAP the option "small steps (-speed)" for more reliable solving. The reliability will be very high but speed two or three time slower. Above options can be set using the command line. The program will accept FITS files, JPG, PNG, BMP or TIF files. The FOV, RA,DEC options are intended for none FITS files. Not required for FITS files having the values in the header. -ra center_right_ascension hours Optional start value. Normally calculated from FITS header. The declination is given in south pole distance, so always positive. Preference will be given to the keyword values in the FITS header. Front-end programs should provide access to -z and -r options. For most FITS files the command line can be short since telescope position and field of view can be retrieved from the FITS header. If a FITS file is not available, preference is a non lossless image format like .PNG or .TIFF or RAW like .CR2. If possible in 16 bit or original 12 bit format. Not stretched or saturated, as raw as possible. For formats other then FITS the RA,DEC position and -fov (image HEIGHT in degrees !!) should be added. Reducing the "maximum number of stars to use" will result in a faster solving but also an increased risk of solve failure. In command line mode the program produces two output files at the same location as the input image. A .wcs file containing the solved FITS header only and an INI file using the standard FITS keywords. The reference pixel is always specified for the centre of the image. If the ASTAP is command-line executed in MS-Windows, it will be shown by a small ASTAP tray icon on the right side of the status bar. If you move the mouse to the ASTAP tray icon, the hint will show the search radius reached. To refresh the value move the mouse away and back. The image height in degrees. Downsample setting and the input dimensions of the image to solve. The α and δ of the start position. See conditions required for solving to fix solve failures. CCDCIEL, using ASTAP as solver. ASTAP is a menu option in the CCDCIEL program. Just select ASTAP and follow the guidelines in the help file. Progress is shown in tray icon and popup notifier. Solving should be reliable. In case of failure, have a look to conditions required for solving. If you images are more then 3000 pixels wide, start ASTAP. and click on the ∑ button, select alignment tab and set downsample to 2 (or 3). Save settings by selecting menu FILEe, SAVE SETTINGS, or leave program with menu FILE, EXIT. Rename the ASTAP.EXE program as Platesolve2.exe Then select in APT, pointcraft, settings, the directory where this surrogate platesolve2.exe ( renamed astap.exe) is located. Start ASTAP manually (PlateSolve2.exe). Click on the ∑ button, select the alignment tab. Check mark "Convert to FITS" and set "FITS bin" at x4 or x6 r or x8. 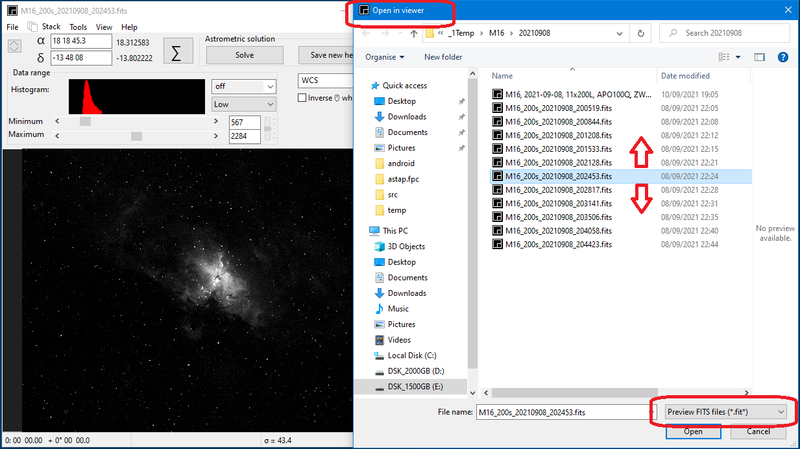 Downsample should be set such that the file dimension are near 300 or 400 pixels wide/height for speedy display in the planetarium program. The solution is written to the APM file. APT will read it. If set in the ∑ alignment menu, the JPG is saved as FITS with binning as specified. The FITS file will also contains the solution and could be displayed in a planetarium program. Downsampling should be set such that the file dimension are near 300 or 400 pixels wide/height for speedy display in a planetarium program. If you images are more then 3000 pixels wide, start ASTAP. and click on the ∑ button, select alignment tab and set downsample to 2 (or 3). Save settings by selecting in the viewer pull down menu FILE, SAVE SETTINGS or leave program with menu FILE, EXIT. Alternatively you could rename the ASTAP.EXE program as Platesolve2.exe Then select in NINA settings, the directory where this surrogate platesolve2.exe ( renamed astap.exe) is located. Later NINA versions could have full ASTAP support making above instructions obsolete. For SGP use ASTAP as a PlateSolve2 substitute. The orginal PlateSolve2.exe is located at C:\Users\you\AppData\Local\SequenceGenerator\ Where "you" is your user name. Test it with SGP. The confidence will be always 999. No PlateSolve2 window will be shown. If you select in SGP the PlateSolve2 setting "Max Regions" (=3000) this will force a search up to 90 degrees diameter. However the solver will be most likely stopped halfway by a SGP timeout. The single executable astap could be used anywhere. Standard directory could be c:/opt/astap but also at your home folder. If you want to use astrometry.net this is described at installation. To get the Astrometry.net solver type: sudo apt-get install libcairo2-dev libnetpbm10-dev netpbm libpng-dev libjpeg-dev python-numpy python-pyfits python-dev zlib1g-dev libbz2-dev swig libcfitsio-dev You also have to download index files. This ASTAP version can import raw images from almost any digital camera, For this ASTAP executes the DCRAW program from Dave Coffin. DCRAW is included with the ASTAP Windows edition and can be installed in Linux by the "sudo apt-get install dcraw" command. Where a bias image could be used as flat-dark image. The master flat should be averaged by a 2x2mean to remove Bayer matrix artifacts. Then the Bayer matrix is applied and finally the images are stacked in mode average or sigma clipped. Back to the HNSKY software page.